A ranged weapon is any weapon that can harm targets at distances greater than hand-to-hand distance. In contrast, a weapon intended to be used in man-to-man combat is called a melee weapon. Ranged weapons give the attacker an advantage in combat since the target has less time to react and defend. It also provides a safer combat option since melee combat often becomes a life or death struggle where each member has a high probability of dying. 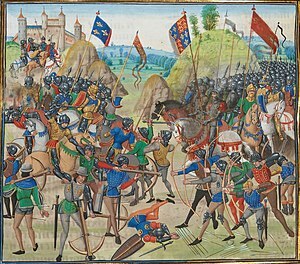 Early ranged weapons include thrown weapons such as javelins, slings, darts, the bow and arrow, and medieval siege engines like stone throwers, catapults, ballistas and trebuchets. These ranged weapons were extremely effective in combat in comparison to close-combat weapons, as they gave the wielder opportunity to launch multiple projectiles before an enemy armed with melee weapons or shorter ranged missile weapon posed a threat to him. 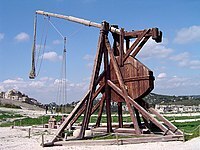 Siege engines were also used for passing or hitting obstacles like fortifications. After the invention of gunpowder and the development of firearms, ranged weapons became the weapon of choice. In modern warfare, ranged weaponry is used in the form of cruise and ballistic missiles. Maximum effective range of a weapon is the greatest distance fired and able to produce casualties or damage consistently. 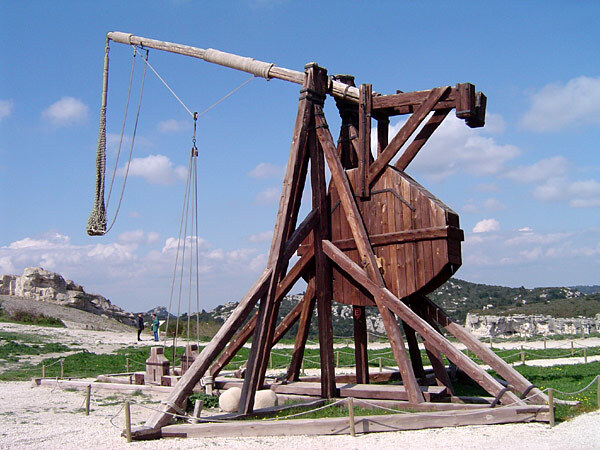 Trebuchet at Château des Baux, France.